This footage is from a 15-minute vintage sprint race around Laguna Seca. The thoroughly insane RX-7 not only goes to plaid and then some—I think I just saw my life flash before my eyes when he gets to the long straight, man—but it also laps most of the field. That’s right: in only 15 minutes. Of course when you’re racing a full-tube-frame, 2,100-odd pound four-rotor RX-7, that’s kind of to be expected. Road & Track has a fun piece on what it’s actually like to drive this car from a couple years ago, if you’re curious. It’s all very heavy and the gearbox requires you to rev-match just to go into gear, but the phenomenal grip and speed make it all sound very worth it. All of that power gets routed through an H-pattern manual gearbox, too. 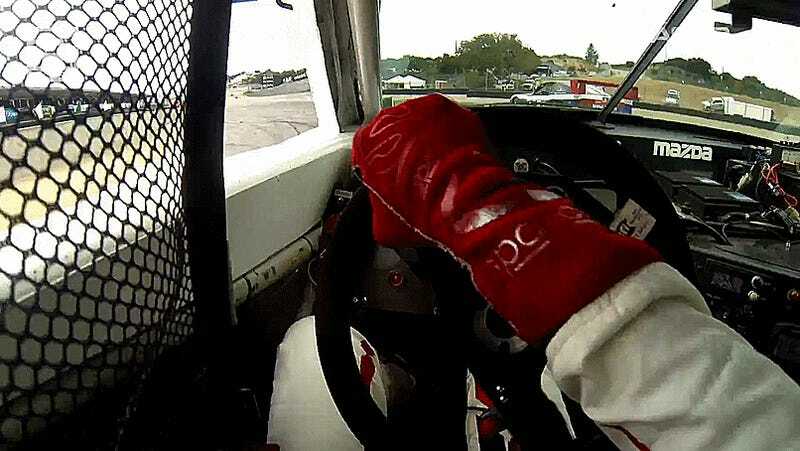 Holy crap, this is a fun onboard video.